For many area businesses, their customers reside beyond the borders of Houston, Texas, even the United States or North America. Business is no longer restricted by geography, and neither should your IT infrastructure. Thanks to the cloud, location is now legacy. Users and customers can now access the resources they need from Houston or anywhere in the world at any time, giving them freedom and flexibility. Cloud services is based on a variable cost model rather than a fixed cost structure. In the past, businesses had to fund large capital expenditures into their hardware IT infrastructure to host their applications, digital services and data. Using cloud services, you only pay for what you use. By freeing up precious capital, businesses can focus their investments into their core business and create new opportunities. Through cloud services, businesses can not only lower their IT cost structures, but also attain the levels of agility and flexibility that their businesses require in order to respond to opportunities and industry disruptions in quick fashion. With cloud services, you can respond to fluctuating work demands with appropriate resources in real time. Whether due to seasonal spikes in demand or unforeseen events, cloud computing gives you the dexterity to bring additional resources online to handle increased pressures and pairing them down once the spike has curtailed. By storing your data within the cloud, you can seamlessly synchronize files across all devices and platforms. Instant access to important data makes collaboration between employees easier than ever before. Automated backups to cloud-based storage systems ensure that your important files are safe by functioning as part of a redundancy system that maintains multiple versions of files across multiple platforms. Cloud services also presents nearly limitless scalability. Your cloud network can grow in step with your business, with no need to purchase additional equipment to increase processing speed and efficiency. The cloud is a new frontier and can be confusing with all of its available offerings. NSC offers cloud integration services and managed IT solutions to Houston area businesses to make things less cloudy. Let NSC help bring your business into the cloud-based world and reap its benefits. Spreading processes across a number of different computers was once the epitome of processing speed. Now, users have a much more efficient way to reduce the workload of a computer: cloud integration. Without knowledgeable IT consulting professionals, businesses will never realize the advantages if they allow their systems to exist in isolation from each other. 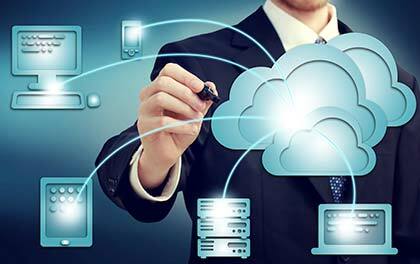 NSC Information Technology Group offers cloud integration services and managed IT solutions that will help bring your business into the cloud-based world. There is far more to the cloud than just online storage. While this is a vital component, the ability to seamlessly synchronize files across all devices and platforms makes the cloud invaluable. Instant access to important data makes collaboration between employees easier than ever before, and automated backups to cloud-based storage systems ensure that your important files are safe by functioning as part of a redundancy system that maintains multiple versions of files across multiple platforms. Cloud integration also allows businesses to extend their investments. Through efficient integration with legacy systems, businesses can prolong the functionality of older computer systems. Legacy systems tend to be such an essential part of any company and running dated but necessary software is more cost effective than upgrading or replacing them. Integrating through the cloud ultimately reduces costs by reducing the need for mid-level software. Cloud integration is also scalable. As your business grows, so too can your cloud system. Unlike before, there is no need to purchase additional equipment to increase processing speed and efficiency; the cloud is almost unlimited in size. Your on-site computers access the cloud; they do not define it. If your business has operated in a certain way for years, it can be difficult to implement a new system. It is even harder when the IT team you have working for you does not fully understand cloud integration. At NSC Information Technology Group, our expert specialize in cloud integration services. You will find no jack-of-all-trades work here. Our team will implement the cloud into your existing system, as well as multiple network security protocols in order to ensure the safety of your files on the cloud. IT outsourcing saves you money by providing your businesses with only the services you need. We also offer IT consulting services to help you determine what system is best for your company, and to lay out a business plan on how to best implement the cloud into your existing operations. Take advantage of all the benefits of cloud integration and contact NSC Information Technology Group today.